Long before air conditioning, ATMs, email and mobile phones travelling was a tricky, lonely, expensive business – it still can be. Indeed, we travellers tire of out-of-touch homebodies telling us how “lucky” we are to do so much travel. My reply is usually something like this: “Luck has nothing to do with it, Sunshine. I don’t have my own house as you do, I have no spouse or children. I’ve had to do most of my study by correspondence and I work like a slave on these treks: I sit on the back of trucks for days; arrive there to find my way through the jungles and fight off killer caterpillars, dodgy police officers, malaria, bar touts, sleazy men, pickpockets, heat stroke and/or cannibals. Where’s the luck?” However, I will admit that life is much easier for today’s traveller than it was even 20 years ago. One can email family and friends, there is usually access to phones and wifi and there is no need to stuff my socks full of traveller’s cheques when there is an ATM around the corner. To make the life on the dusty, long road easier, there are several stalwart traveller’s establishments that have always been there for us on our journeys.They were vital lifelines and these establishments have saved the skin of trekkers and international businessmen alike by offering a free phone call to worried parents from the office phone; a friendly ear; a book to exchange or jam on toast when we really needed it more than anything – usually when coming out of a desert with no clean clothes, infected cuts on our knees and no local currency. An establishment that offers relief from a snowstorm, a siege or weekend hotel rates makes one one most grateful. 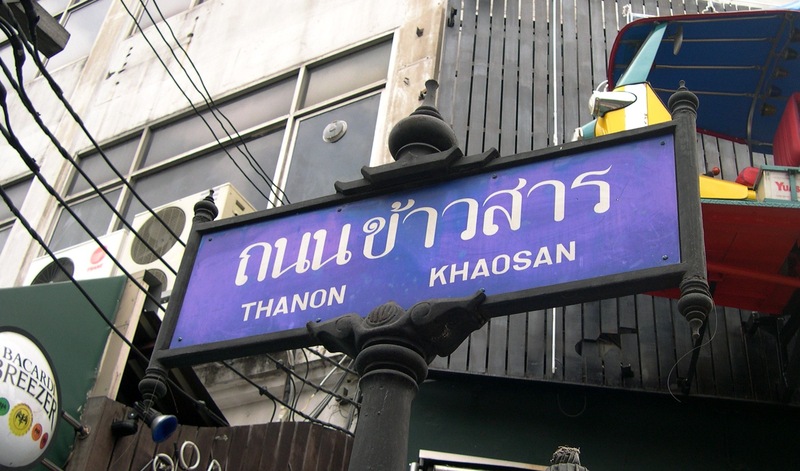 Khao San Road, Bangkok is like a honey pot to the young traveller. If you want it, they’re got it: travellers wait for friends, get pedicures, fall in love, try their first grasshopper and purchase illicit “designer” goods. I’ve arrived on this street in tears on a Saturday at 6pm and ordered a brandy-and-lager chaser with my last baht. The friendly proprietor of one of the establishments gave me a room, fed me and let me keep a bar tab till the banks opened the following Monday or “whenever you need” one can go shopping on Khao San at 2.30am and had a someone in the shop convince me to buy a bus ticket Laos at 7am. 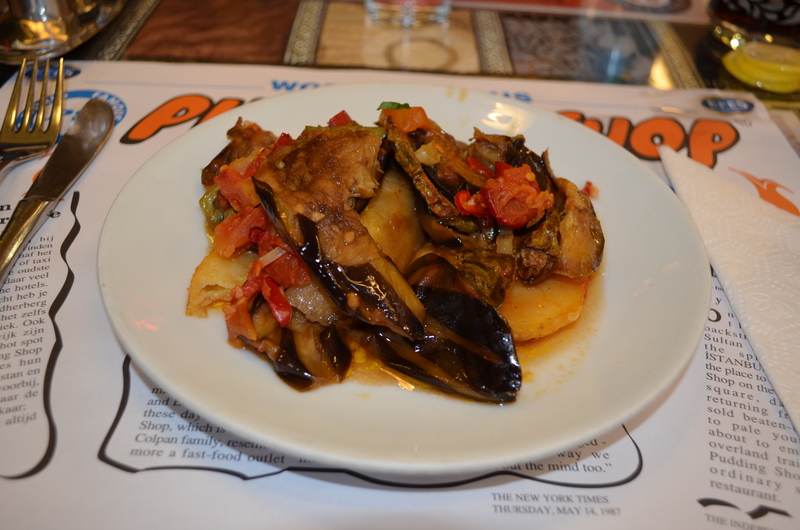 Lale Restaurant, or “The Pudding Shop”, Istanbul has been taking care of travellers since 1957. 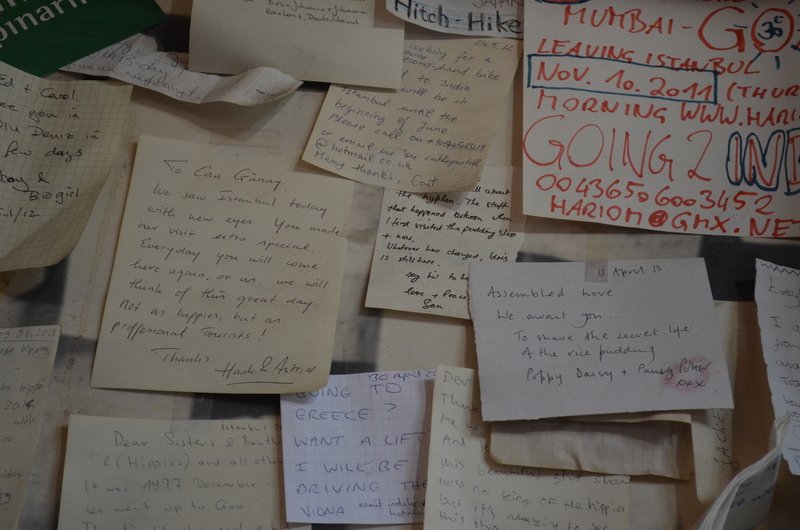 It isn’t just the delicious Turkish fare and Shisha pipes that attracted the adventurers but rather the now-famous message board where one could leave a forwarding address, buy a car, leave a love letter or recruit a new travel buddy. Some of the original message are still there. Everyone stopped at this watering hole on the hippie trail to India in the 70’s and it was immortalised in the 1978 film Midnight Express. Owners Idris and Namik Çolpan gave many hippies a bed and a place to wait for the next ride to Nepal. The Pudding Shop was famous for feeding poor foreign travellers under the condition that they will send the money once they get home. Idris, now an old man, says that they always paid – who wouldn’t do the right thing for such a kind people? Chung King Mansions, Hong Kong has been the cheapest place to stay in town since it was built in the 1960’s. I don’t know if anyone remembers it as ever being new and shiny. This structure of 5 tower blocks houses thousands and thousands of residents and these days it’s famous for the high quality Indian, Pakistani and Nepalese restaurants downstairs. It is described in my first Lonely Planet (South-East Asia on a Shoestring 9th Ed.) as a “huge, high-rise dump… with approximately 80 guesthouses.” The mall has foreign exchange bureaux, hairdressers, some travel agents (where you will be invariably asked “Ticket to Bombay No? Ticket to Bangkok No?” no matter how often you pass) and a sari shop as well as plenty of places to eat. I don’t know if there is any other building in the world where you can have a suit made by a Sikh gentleman from Goa, buy a watch from a Nigerian and have a chat with a French tourist in a Filipino shop. The block in this enormous fire trap are in various states of dilapidation and no matter how much repair work is done they are basically unsanitary and there are always a few ragged drug addicts lurking in the ancient, rickety elevators or rats – dead and alive, generally outside. You can see for yourself as Wong Kar Wai’s movie Chungking Express was filmed here. The guesthouses keep changing their names but they seem to remain a guesthouse of some sort. Some of them are actually ok – at $25 p/night, you won’t get many places that are cheaper in Hong Kong. The building is actually in a fantastic location on Nathan Road. Since they change the guesthouse names so often I can’t recommend the cleanest or nicest spots but you can have a look around and maybe check on the Lonely Planet’s Thorn Tree forum before you leave. Be alert: even though Hong Kong is so safe this place is not typical for Hong Kong! A tourist was killed during a fire many years ago and just recently a Chinese girl went missing, last seen in one of the buildings. Go have a look-see at least, so long you like the smell of curry because it stays with you long after you’ve left… 36-44 Nathan Road, Kowloon, Hong Kong Raffles Hotel, Singapore. The $20 linen tea towel in the gift shop reads Where else should one partake of the Singapore Sling but at Raffles Hotel. Yes, Raffles certainly is Singapore’s most famous institution, offering the finest in opulent, colonial luxury at the highest prices in the country. This hotel, established in 1887 was never intended to cater for local tastes and it’s most famous patrons include W. Somerset Maugham, Rudyard Kipling and that veteran traveller, Ernest Hemingway. The hotel was one of the first places seized by the Japanese after the Fall of Singapore in 1942 and one of the first recovered by the occupying forces as a convalescent retreat for ex prisoners of war. I do hope the Malay staff who buried The Raffles silverware and its finest wines minutes before the arrival of the Japanese were not overlooked as Employees of the Year. The Long Bar and it’s $25 Singapore Sling? A one-off experience for travellers only that is, surprisingly, on the bucket list of many tourists passing through Singapore. The afternoon tea in the Tiffin Room is another such extravagant treat. 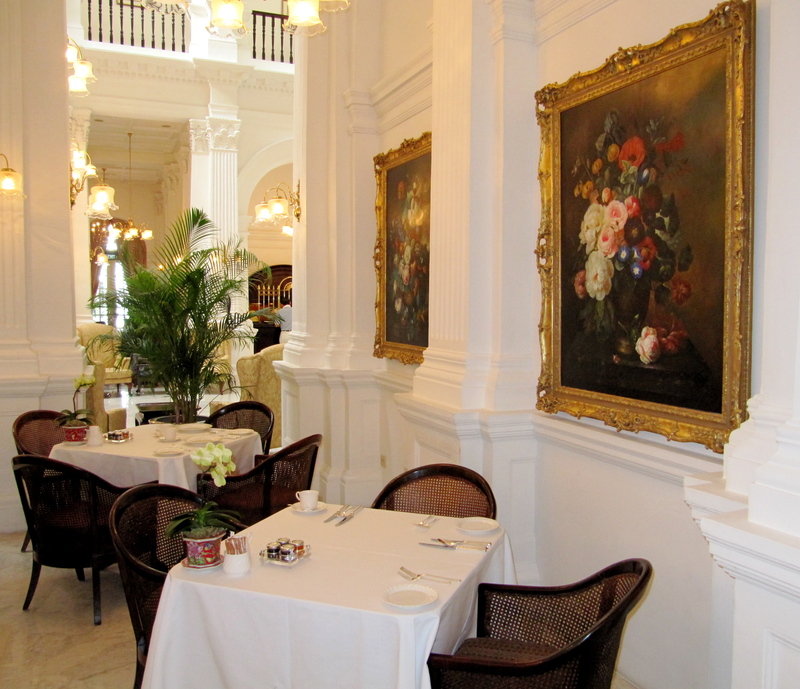 One thing is guaranteed here: you will feel (and dine) like royalty at Raffles. 1 Beach Rd, Singapore There are many similar travel meccas that are long gone, the victims of political overthrow or modernisation. Notable mentions include: the old foreign concessions of Shanghai, which was made extinct as it became part of xenophobic Red China; Earls Court, lost to us as a traveller’s hub due to gentrification and outrageous land prices; Le Phnom, once an international journalist’s hub, which exists now in a different capacity as Le Royal by Raffles.Some have been replaced with an international hotel chains. I’m pleased that a few of these places still remain. I think of these places as historical sites to be preserved as a memorial to travellers of the past. I think I’ll be fleeing to the Raffles Hotel if the Fragrance Hotel in Geylang lets me down again! Chung King Mansions sounds crazy! If I’m ever in the area I’m going to need to check it out just to see what it’s like. Make sure you do, Katie. Get yourself a genuine Rolex for $40 – or a phone card!